Connectivity is a distant possibility, but a possibility nonetheless. Nintendo has historically been pretty good about providing connectivity between its handhelds and traditional consoles. The SNES had the Super Game Boy, the N64 had the Transfer Pak, and the Gamecube had the GBA link cable, among other things. The Wii and the DS didn't mesh quite as well, but according to Shigeru Miyamoto, the Wii U and the 3DS may see some cross-platform features in the future. In spite of the challenges linking the two systems provides, Nintendo is open to doing it at some point - just not right away. While there was some limited Wii/DS connectivity, Nintendo didn't focus much on linking the two systems together. "If we are going to [link the] Wii U and 3DS, there would be three screens to consider," Miyamoto points out. 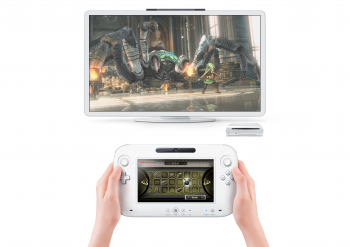 "The reason why we were not so eager to do a similar thing between Wii and DS if that it would have become very complicated using two screens on the DS and one screen on the Wii." In addition to the logistics of balancing three screens at once, Nintendo has philosophical concerns about catering to a relatively small group that owns both devices. "[One] of the great lessons we have learned is the simple fact that those who own both are much fewer than those who don't own both. So what we decided early on when considering the Wii U design was that we had to make it so that every single purchaser of the Wii U is going to have the same play conditions, the same equipment." Nintendo may not have any immediate plans to connect the Wii U and the 3DS, but it hasn't ruled out linking them, either. "There are things that can easily done by transferring data between Wii and DS or 3DS systems," Miyamoto remarks. The good news is that the advent of ubiquitous WiFi means that if the two devices can link together, players probably won't be required to buy an additional cable to do so.